The Catholic Hipster weblog: Is Abstaining A Way To Exercise Our Right? Is Abstaining A Way To Exercise Our Right? There has been a ton of ink spilled during this election cycle on choosing the lesser of two evils vs. voting for a third party candidate who keeps your conscience clear but has no chance of winning vs. abstaining from voting altogether. "Day considered the ballot and decided that it was not worth her time. Fasting and prayer, on the other hand, she found worthwhile, along with sharing resources in community, breaking bread with the hungry and welcoming the stranger, tending gardens and engaging in daring acts of nonviolent protest. These activities constitute a practical political program that she could embrace. It is a program that, unlike the paltry and soon to be betrayed promises of the corporate political parties, holds infinite potential to bring peace and healing to this tortured planet"
This spoke to me very clearly, especially given our current political climate. "Submission to authority and co-responsibility for the common good make it morally obligatory to pay taxes, to exercise the right to vote, and to defend one's country." "The citizen is obliged in conscience not to follow the directives of civil authorities when they are contrary to the demands of the moral order, to the fundamental rights of persons or the teachings of the Gospel. Refusing obedience to civil authorities, when their demands are contrary to those of an upright conscience, finds its justification in the distinction between serving God and serving the political community." I'm sure I'll be told I'm wrong, but 2242 seems to open the door for not voting in a context where civil authorities and their demands and interests are contrary to the moral order and the fundamental rights of persons, which we most definitely see in our current situation. In addition to that, we have had some bishops recently sharing opinions that would seem to make allowances for Catholics to avoid voting in this current political climate. So, in an effort to hold both the venerable example of Dorothy Day and the Catechism of the Catholic Church in mind, what is a Catholic supposed to do? 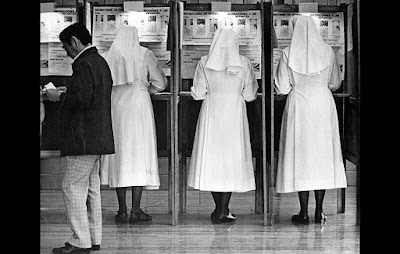 Better yet, what is a Catholic able to do or not do when it come to casting a ballot? With all of this in mind, I think this issue deserves a deeper look within ourselves. What do it mean to "exercise the right to vote"? Does exercising the right to vote include making the decision to abstain from voting? Does the fact that you will be voting for the common good down the ballot cover you, so that skipping the Presidential vote is all good? Does the quote so often attributed to Dorothy Day, that "Our problems stem from our acceptance of this filthy, rotten system," lend to us opting out of voting for President as a way of showing we no longer accept this filthy, rotten system? I don't have an answer to any of these question, but raise them because I think they're worth a discussion. In the meantime, as we approach election day, I'm left still undecided between abstaining from the Presidential vote...or voting for a magician. If I can't vote for any candidate, as in this election, I just write in my Bishop's name. It feels more like a protest vote. I'll be writing in your favorite candidate and mine now that his paperwork is filed in Virginia. And when you go to Heaven for doing your conscience and I go to Hell for not doing mine, will you come along for fellowship? Captain Reynolds: May have been the losing side. Still not convinced it was the wrong one. What's right is rarely popular, and I'm getting plenty of heat from Catholic family and friends for not throwing my support behind a candidate I wouldn't leave alone with my teenaged daughters. I was fully intending to vote for the awesome third party candidate, but then I found out that in my state (Oklahoma) it's against the law to do write-ins, so the only presidential voting options are the ones given to me on the ballot (and he isn't one of them). So it's been a good chance to remember that as much as I have a duty to vote, I have a duty to follow God and a well-formed conscience first, and that I can still vote on other officials that are on the ballot and the important state propositions that will be included there as well.